Create & Manage Content your way! 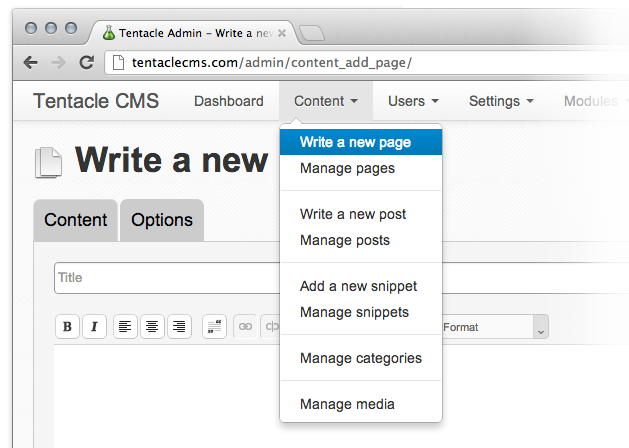 Tentacle makes it easy to Design, Develop, and Write content for the web. It's goal is to help web professionals and small businesses create fast and flexible websites with the user in mind. By focusing on the user we are able to refine the processes for every one. By building Tentacle on a light weight flexible framework we are not imposing strict rules on you. By working with and providing the tools you need we hope you can accomplish more in less time. Writers will be able to add custom data just as easily as filling out a web form with contextual titles, a full WYSIWYG editor, with Validation. Designers can stick to what they know and use HTML, CSS, PHP, JS to do their bidding.